The Moody College of Communication dedicated CMB Studio 4E as the “Neal Spelce Broadcast Journalism Studio,” following a fundraising campaign that was supported by 24 Moody College friends and alumni. The dedication took place Monday, Sept. 19, 2016 in CMB Studio 4E. 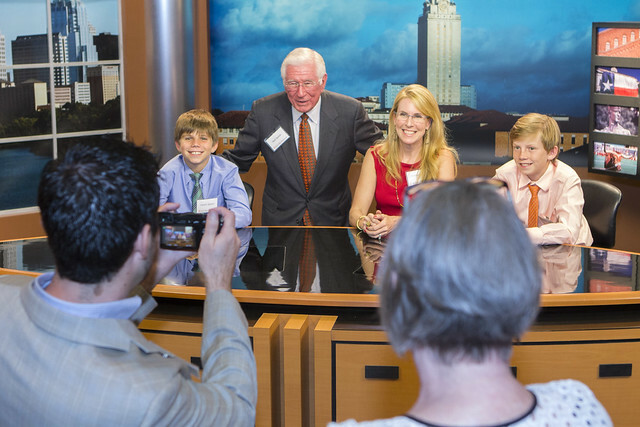 Neal Spelce (B.A., B.J., B.F.A ’58) has been a media legend in Central Texas and beyond for more than 50 years in the fields of journalism, public relations and media. After earning degrees in journalism, speech and radio/television from The University of Texas at Austin, Spelce worked as a broadcast journalist for KTBC-TV, where he became known for his heroic live coverage of the UT tower shootings on campus Aug. 1, 1966. Spelce went on to serve as a communications executive and has consulted business leaders and political candidates across party lines including President Lyndon B. Johnson, Senator John McCain, New York Governor Mario Cuomo and Texas Governor Ann Richards. Speakers at the event included Catherine Robb, attorney and granddaughter of Lyndon B. and Lady Bird Johnson; Robin Rather, CEO of Collective Strength and daughter of journalist Dan Rather; Moody College Dean Jay Bernhardt and Assistant Dean Mike Wilson; and School of Journalism Director R. B. Brenner. Spelce also delivered remarks as he accepted the honor.